It was a Friday morning in December 1985. I remember it well. Barry waltzed into our office, hung up his scarf and coat and plopped himself down at his desk. He gripped the edges of his seat and spun around on it contemplatively once or twice. He had news and he couldn’t keep it in. Barry and I shared a corner of a screened-off open plan office on a roundabout in Bracknell. We worked hard-and-well together but there was always time to dissect the crucial occurrences of any given day. I didn’t have to ask Barry who this ‘Someone New’ was. Nobody did. On that Friday morning, not as long ago as some of you might think, Barry was not alone in having fallen instantly in love, a little bit, with Whitney Houston. Thursday night was ‘Top of the Pops’ night. Nobody was avidly glued to it in 1985, nobody was drooling with anticipation of the next act to debut, but nobody was missing it either. Everybody was keeping an eye on it, to see who or what might suddenly appear. 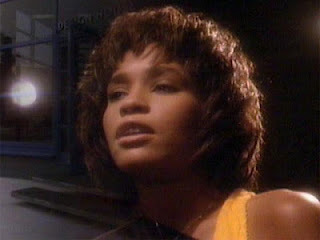 And I think a lot of people fell a bit on love with Whitney that evening. The song was, of course, ‘Saving All My Love for You’ and we didn’t see a live performance of it that evening, we saw the video. Who couldn’t fall in love a little bit with that girl that evening? She sang like a dream, she had the most extraordinarily beautiful, open, face and she looked so very happy to be saving all her love for me. Natural talent and beauty simply exuded from her. We had never heard of her before that evening and we have never forgotten her since. Every Sunday morning, the radio alarm comes on at the normal week-day time and usually gets clicked off again within a grumpy New York Minute. This morning, in the brief moment between coming on and being switched back off again, a snippet of news slipped through. Whitney Houston is dead. When I got up and thought of her a bit, I thought of a Friday morning in December 1985 when Barry came in and proclaimed his latest flame. To touch someone’s life, however briefly, what more can we ask?